The vampire story that started it all gets new life for a new generation. The harrowing events unfold through e-mails, text messages, Web pages, Twitter feeds, and instant messaging--the natural modernization of Bram Stoker's original "Dracula." Besides some biting and an uncomfortable kiss between a young girl and a really old vampire, you're all set. The mood for this book is definitely intensity. There's so much happening so quickly. Main character – yay or nay? I guess the main character would be Mina. She's a cool chick. She's a little obsessed with her boyfriend but when it comes down to it, she gets her shoes dirty trying to fight off vampires and save the day. He's cute. He's a doctor. What's not to like? This isn't a crust factor but more of a WARNING. This book is written all through texts and emails. I say this as a warning for two reasons. 1) Some people don't like to read that style of writing. I'm used to it with Meg Cabot, so I didn't have a problem, but some people aren't. 2) The texts were kind of hard to read on my Nook™. Might want to buy this one paperback style. I LOVE this cover. It completely draws you in. The blood dripping. The iPhone. The fact that for a second you read the author's name and think Rebecca Black wrote a book (jk kidding. jk kidding). But seriously, A+++ work on the cover. Totally captivating. I chose Happiness Is a Warm Gun by The Beatles (the greatest band to ever exist. you can't prove otherwise) because it has the same creepy vibe as the book. Then there's the talk of a 'fix' which can be equated to a vampire's thirst for blood. Also, its The Beatles. The Beatles go with everything. This book is the modern day version of the original Drakula, so I'd suggest giving the classic a whirl if you enjoyed this. 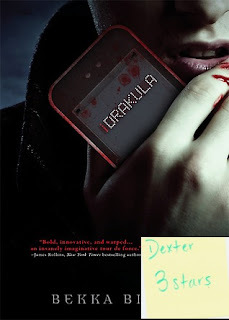 I'm giving iDrakula 3 stars. Now, let me explain why. I really enjoyed the plot and action of the book but I felt that I was rushed through everything. It might be because everything is text and email, but I felt like I missed a lot of the action. I just wanted more... pages. More scenes. But it was still really good and a fun read. We'd like to thank Bekka Black for providing us with her book.